“Ek seekh kebab, ek nahari, ek korma, ek keema naan, ek shahi tukda…” and the sounds are still echoing in my ears. I visit Bazar Matia Mahal in the lanes of Jama Masjid, situated in Purani Dilli, almost four times in a week and these words echo every night when I go to sleep. For me, it was a bit unusual to hear the same words in the kitchen of a restaurant in Gurgaon. At one point of time, I thought I was again in an eatery in Matia Mahal. I visited Purani Dilli’s Al Karam restaurant in Gurgaon the previous evening. The complete address is A-133, Supermart 1, DLF Phase 4, Gurgaon. Another branch of the same restaurant is in Satya Niketan. Even after attending the much hyped launch of Burger King in the morning, I was more excited to visit Al Karam’s to savour its kebabs and biryani. Indeed, the evening turned out to be “foodilicious”. The entrance of the restaurant greets you with a kebab stand, which was indeed very welcoming to a foodie like me. I reached at the very time the kebabchis were setting up the skewers to grill the kebabs. Within minutes, I was overjoyed to see the kebabs rolling. While most restaurants in Delhi are run by the names of big chefs, Varun, the proud owner of the restaurant graciously introduced to me his kebabchi, Naushad, shagird of Lallu Kebabchi and Kallan Bawarchi in Jama Masjid. Naushad has also briefly worked in a kebab corner in Daryaganj for one and a half years before joining Al Karam’s. I had a short interaction with Naushad as he was leaving for a catering order in Gurgaon, but it still elevated my expectations. The journey of Al Karam’s started from Bazar Matia Mahal in Jama Masjid, where Varun met Umez Khan, the owner of Al Karam’s in Jama Masjid and both of them together set up Purani Dilli’s Al Karam in Gurgaon in November 2013. I left it completely to Varun to introduce me to the menu and my food journey began with gilafi kebab (Rs. 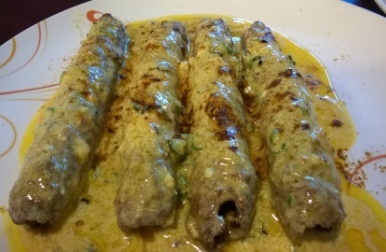 230), minced mutton kebabs in a crisp coating of beans, green chilies, and paneer. The kebabs were tossed with butter and cream and I liked them, however, I must admit I like my kebabs served with green chutney and onions, and nothing else. I have had gilafi kebabs with a coating of capsicum at another place but Al Karam’s has a very different taste altogether. Another type of kebabs I had at Al Karam’s was achari kebab (Rs. 230). This was an interesting mix of the mirch masala of pickles in minced mutton and was full of flavours. In curries, I had hakeemi chicken tikka (Rs. 500) and changezi chicken (Rs. 500). Both of them again had an unusual taste. Hakeemi chicken consisted of pieces of roasted chicken mixed with loads of Nutralite butter, cream, crushed brown onions, and topped with slices of ginger. The brown crispy onions added a nice flavour to the chicken. Changezi chicken, in Varun’s words was “daandedar”, in the sense that it had “daanas” of brown onion in the gravy. I also had mutton biryani with the gravy of korma. The rice of the biryani was long and flavourful, and the mutton pieces were soft enough while leaving the bones. In desserts, shahi tukda made with ghee and topped with cashew nuts is a must try. In Bazar Matia Mahal, shahi tukda has toppings of green and red cherries, which I always remove to get the real taste of shahi tukda. This was my kind of shahi tukda, simple and delicious. The food journey ended with interesting discussions with Varun about the best places to eat nahari, paaya, korma, and biryani in Old Delhi, Zakir Nagar, and Lucknow, where DFW is next heading to, on the 22nd and the 23rd of November. 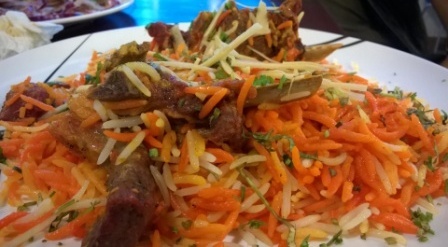 I could not try one third of the menu but I am going to visit Al Karam’s again to meet the bawarchis and kebabchis, and taste the remaining dishes in the menu, which I am sure would be excellent.